The horror anthology is something that is a core part of horror comics. It began decades ago with legendary titles like Creepy and Eerie and it continues today with modern day versions of those titles as well as new ones like End Times, FUBAR, and The Gathering. London Horror Comic has joined the fray and their latest issue is an extra-sized 52-page special. 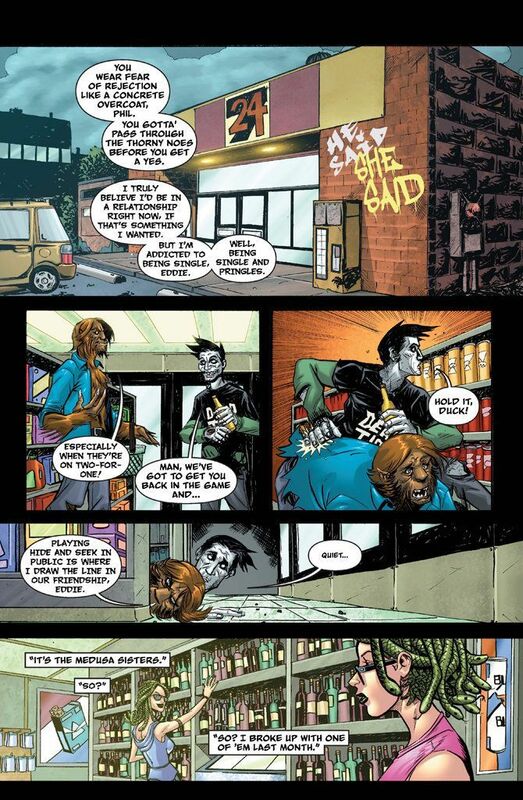 London Horror Comic is a bit different than other anthologies in that all of the stories are written by one person. John-Paul Kamath crafts each of the four self-contained tales in this, as well as previous issues. What struck me about these segments was how easily Kamath can adjust to different tones. The four stories alternate between slightly heartfelt and incredibly disturbing. He lures you into a false sense of security with the opening title, The Game, and then pulls the rug out from under you in Dead Love, and repeats the process with the following two stories. All four of the tales collected here are pretty solid. Usually you end up with at least one weak one in the bunch, but Kamath delivers some solid storytelling. If I had to pick a favorite, I'd go with He Said She Said. It's a quirky arc about a convenience store robbery. Instead of regular people, everyone's a monster. Caught in the middle of this crime are Eddie Zombie, his werewolf buddy Phil, and the Medusa sisters. It turns out Eddie and one of the gorgons had a really bad date not too long ago that ended with a big misunderstanding. The story would have been an average sitcom episode, but it's made more interesting by the inclusion of all these creatures. The action is fun, with Phil throwing Eddie's head at one of the robbers. This is a stark contrast to Dead Love and Friends, both of which get very unsettling. Dead Love deals with a delusional woman who works as a coroner with a special connection to the dearly departed. The last page of this tale is a full page spread that will stay with you for some time. Friends taps into the jealousy that you might have for one of your buddies. Sure, you're happy that they're successful or they got a great girl, but deep down you wonder why they have that and not you. This flips a switch inside the main character and uncovers something very dark. 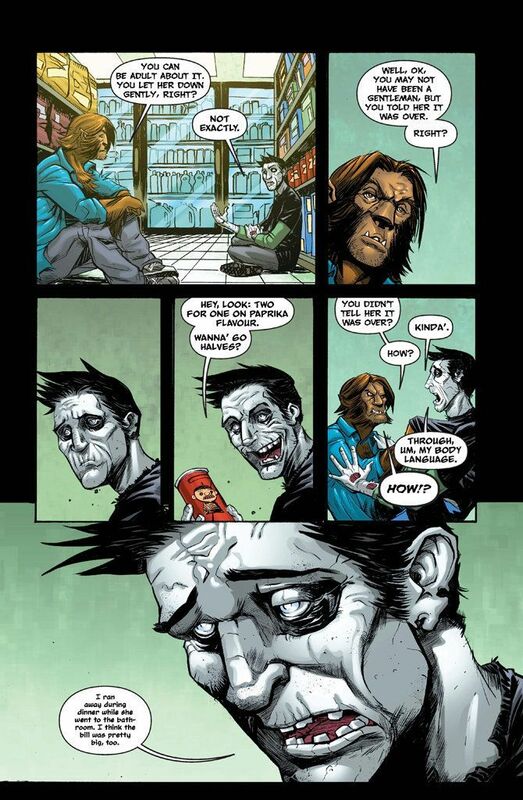 The artwork in London Horror Comic is split between Drew Moss and Dean Kotz. I can't tell you who did what or if they collaborated on every story, but it's pretty great. The pencils are clean and clear with a good attention to detail. The monsters are all varied too, so nothing gets duplicated. Everything has a unique look, so each story has a feel all to its own. Hi-Fi Design colors really stand out too. The comic pops. One thing I noticed right away with this book is that it is of tremendously high quality. The cover stock is thick and glossy. The pages bright and far from the flimsy paper seen in some major publications as of late. Astonishingly, this doesn't affect the cover price as it's only $3.99 for 52 pages. This is the kind of thing that would go for five or six dollars from the Big Two and it would be filled with ads. That's not the case here. London Horror Comic #5 is the kind of horror anthology I really enjoy. The stories are varied and range from humorous to terrifying. The artwork is solid and never disappoints. The quality of the book itself is top notch. Now if you'll excuse me, I've got the previous four issues to catch up on. London Horror Comic #5 can be purchased directly from the publisher's website.